In honor of International Human Rights Day, twelve members of Bay Area Intactivists participated in an #OccupySF march in San Francisco on Saturday, December 10 to raise awareness of the human right to genital integrity. 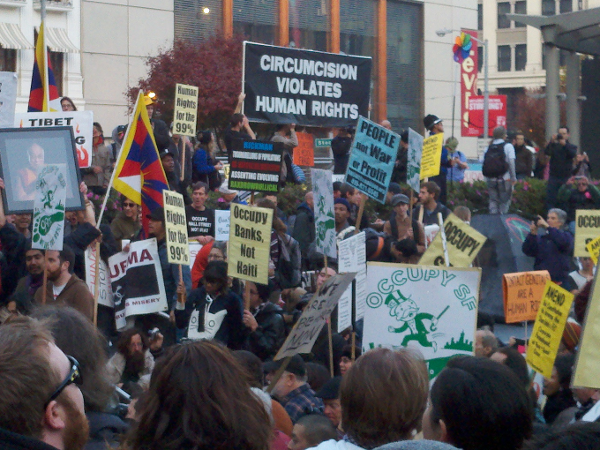 The march began in Justin Herman Plaza and traveled along Market Street to Union Square where several speeches took place. After marchers returned to Justin Herman Plaza, more speakers were heard including Bay Area Intactivists member Lloyd Schofield who spoke about protecting and defending the right to genital integrity for men. Over the course of the three hour event, intactivists distributed leaflets, stickers, and bracelets while discussing the damage caused by circumcision and a child's right to bodily integrity.